This summer’s Gucci handbag collection has arrived in their online store. They vary from totes to clutches to shoulder bags to hobos. 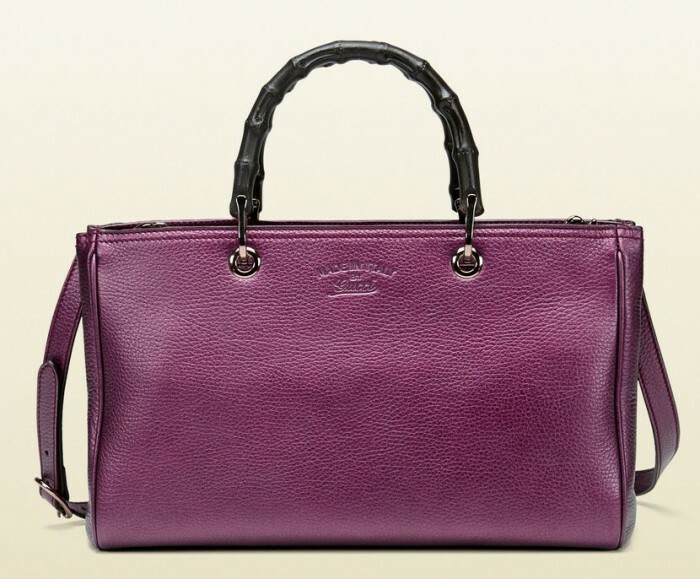 Handbags are offered in various colors and materials to give every fashionista a wide range of options. Here is my top five Gucci handbags for this summer. Have to plead guilty in advance, I’m partial to plain leathers with less razzmatazz. 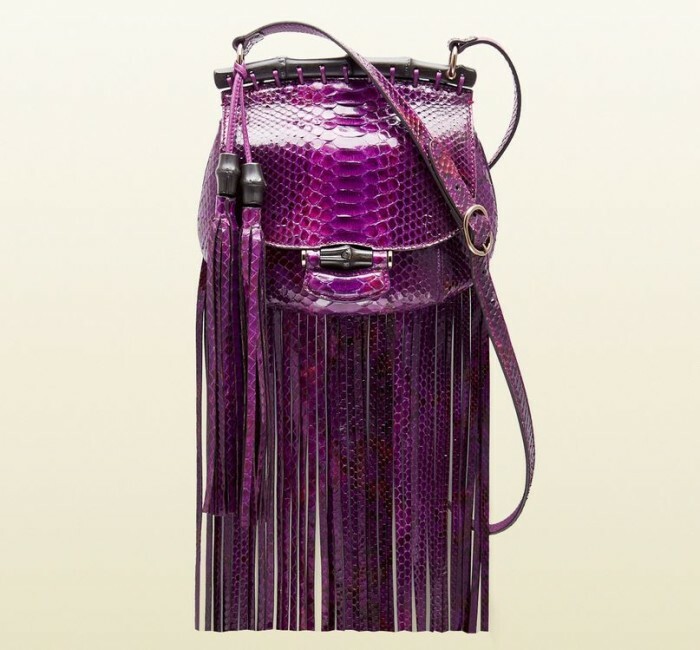 Gucci Nouveau Fringe Python Shoulder Bag – $3,100 This bag gets its inspiration from Gucci’s 1940’s flap shoulder bag. A perfect accessory for city dwellers, it has lacquered bamboo decorations, polished rose gold hardware, maxi stitching and dry-stoned embossed trademark. 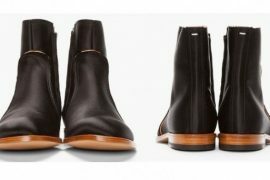 Other details include leather lining, adjustable strap, double tassels and interior pockets with snap and zip closure. Small bag measures 9.5”W x 7.5”H x 2”D. Hip bamboo Leather Shoulder Bag – $2,900 Why this? Its simplicity appeals to me. Except for its low-key bamboo frog closure and antique gold hardware, it’s as plain as it gets. It offers hand and shoulder carry through an 8” drop hand-woven handle and a removable and adjustable strap with 18” drop. Interiors feature zip and smartphone pockets. Measures 15”W x 14”H x 5.5”D. 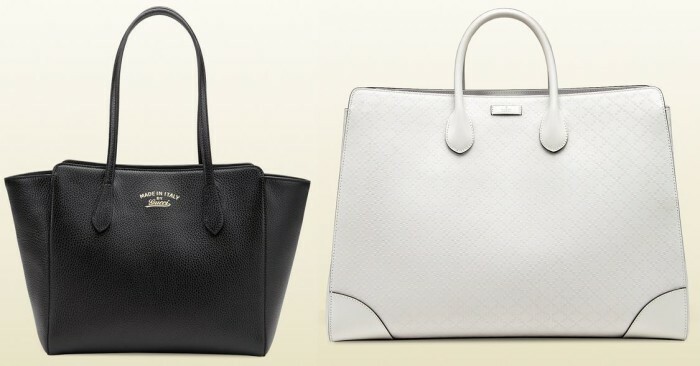 Bright Diamante Leather Top Handle Bag – $2,100 The Diamante is also available in off-white (top image – right). 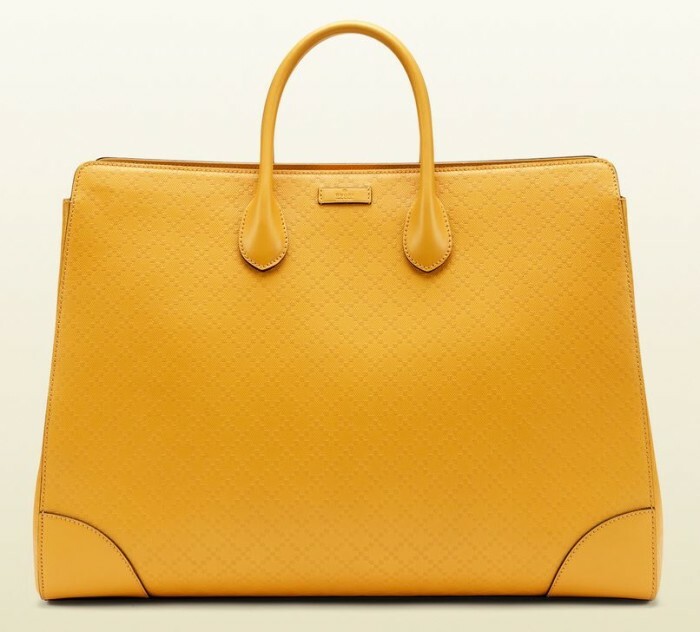 This yellow version features yellow leather trim, light gold hardware, snap closure, protective feet, hand-painted edges and an embossed Gucci label on the outside. Interiors feature natural linen Gucci jacquard lining, leather panels and interior zip and smartphone pockets. Available in large size that measures 17.5″W x 13”H x 5.5”D. Bamboo Shopper Metallic Leather Tote – $1,890 The Bamboo Shopper Metallic Leather Tote is offered in several colors. Features double bamboo handles with 4.5” drop and a long 19.5” removable, adjustable handle with 19.5” drop. Exteriors feature polished rose gold hardware, magnet closure and protective metal feet. Interiors are lined with natural cotton linen. 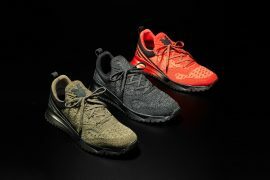 It has an interior zip compartment, snap pocket and, a zip and a smart phone pocket each. Measures 13.5”W x 8.5”H x 6”D. Gucci Swing Leather Tote – $1,100 Perfect bag for a day out in the beach on a sunny day. 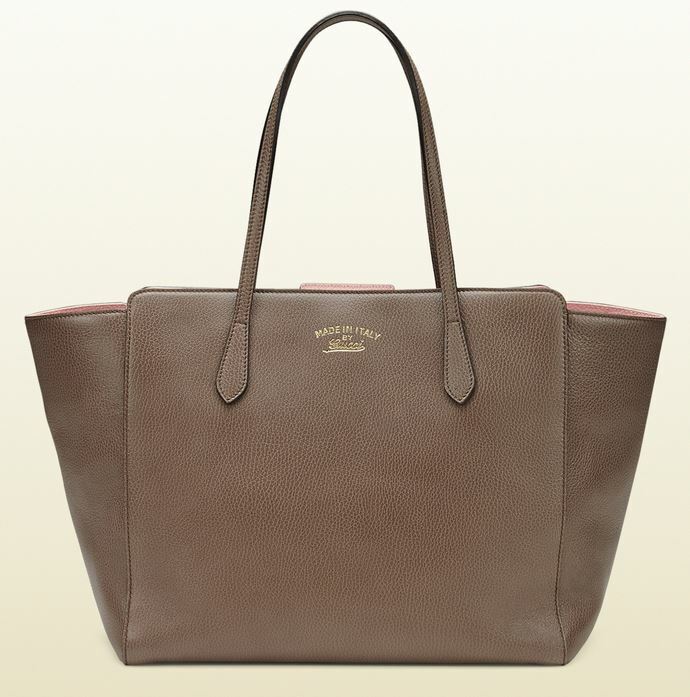 This tote is made of taupe leather with pink leather interior details. This tote is offered in several colors and in sizes medium and small. 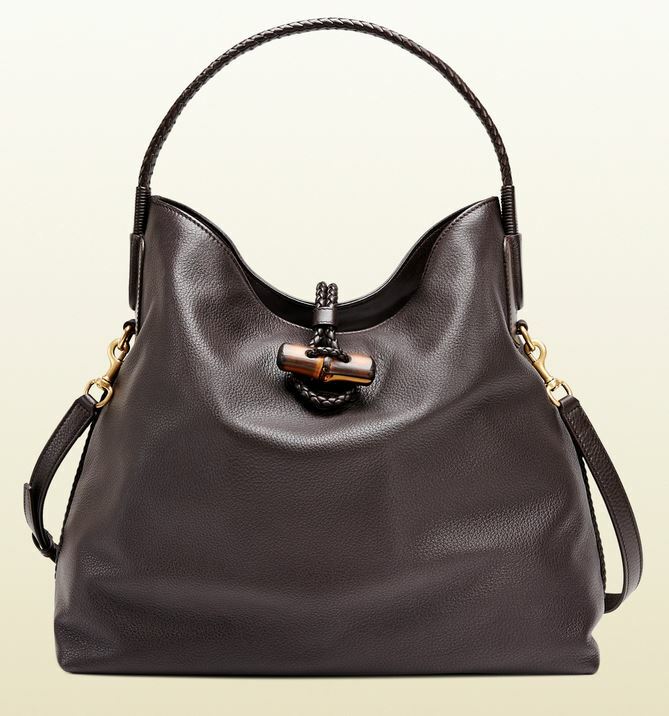 Exteriors feature the familiar embossed gold Gucci trademark, double handles with an 8.6” drop and hidden magnet closure. Interiors are lined with cotton linen lining. Interior details include large zip, smartphone pocket and a zip pocket to fit an iPad. Medium bag measures 13.4”W x 12”H x 7”D. Smaller version (top image -left) priced at $950, measures 10.6”W x 9.5”H x 6.3”D.